When we think of circularity of material flows, we need to understand “outer” and “inner circle” approaches. The “outer circle” approach creats a closed loop of materials through recycling. In the case of electronic goods, this means recovering of precious metals lodged in our gadgets, something only feasible with a sophisticated technology, requiring a scale and where large companies profit. 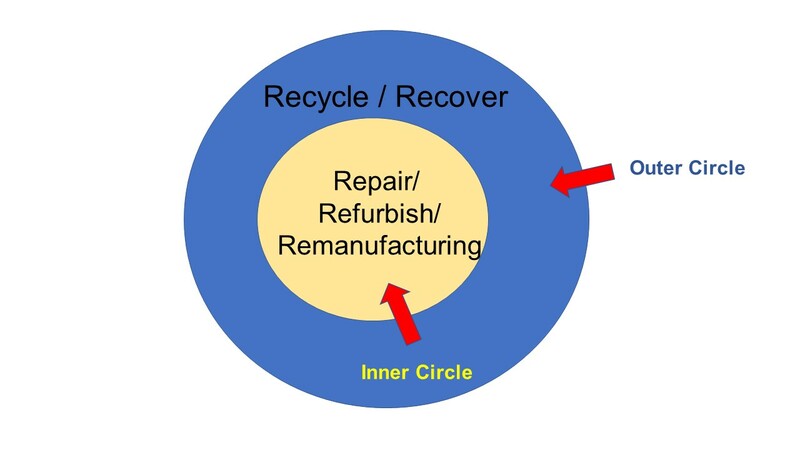 The “inner circle” approach is essentially following route of repair, refurbishing and remanufacturing. It is the inner circle approach where we transform our living from the single-use and throw away culture. When we follow inner circle approach, it helps us to save money, conserve our resources, generate employment and come up with innovations. We extend product’s life cycle through reuse. The inner circle is people centric, it is for citizens and supports small companies. Unfortunately, the inner circle approach to material circulation does not find much space in both public and scientific discussions. We speak more about recycling or the outer circle approach to achieve circularity. We need both – but former should get a preference. Repair is restoration of a broken, damaged, or failed device, equipment, part, or property to an acceptable operating or usable condition. Repair can involve replacement. Refurbishing is refinishing and sanitization (beyond repair) to serve the original function with better aesthetics. Repaired and refurbished products, although in good condition, may not be comparable with new or remanufactured products. In remanufacturing, the product is resold with performance and specifications comparable to new products. How do we know if the repaired, refurbished or remanufactured product is good? Can we certify? The “Remade In Italy” label certifies the use of recycled material / reuse in products. The release of the Remade In Italy ® certification is subject to a verification process by a third-party body (and therefore independent) for the certification of both management and product systems. The Remade in Italy ® label highlights the environmental values ​​of the material / product and is characterized by the assignment of a class, based on the percentage of recycled / reused material present. I may be wrong, but we don’t have such a certification scheme in India and perhaps in several countries in the world. Remanufactured or refurbished products can help companies compete at a lower price with cheaper or lower quality competitors, without reducing quality, due to the resource savings realised, allowing firms to secure greater market share. Economic incentives and disincentives as well as enforcement of legislation on Extended Producer Responsibility (EPR) play an important role to move the inner circle. Recent interest on repair, refurbishing and remanufacturing has led to establishment of reverse logistic chains, i.e. collection and transport systems. Several off the shelf or plugin type technology platforms have evolved such as 12return that help create reverse supply chains from consumers to service providers, operated by “aggregators”. The repair culture did not have much root in the developed economies due to high costs of labour. Realizing the importance of its promotion however, countries in the European Union (EU) have come up with incentives. In Sweden, a tax-refund scheme operates that on the labour segment of household repair bills for white goods and electronics. On similar lines, in Austria, there is a proposal to make repair cheaper by reimbursement of 50% of the labour costs of repair. In France, there are differentiated EPR scheme fees depending on how easily you can dismantle a product for repair, on the availability of spare parts or on whether the information/instructions on how to repair a product are available. These fees are lowered for producers who inform consumers how long spare parts will be available for the product on purchase. In the United States (US), eighteen States have proposed “Right to Repair” legislation. The Right to Repair bill will make easier for people to repair their broken electronic equipment—like cell phones, computers, appliances, cameras, and even tractors. The legislation would require manufacturers to release repair information to the public and sell spare parts to owners and independent repair shops. It is going to be however a bumpy ride as giants like Apple and Microsoft are gearing up to oppose this legislation in at least one State. But how do we scale up and build capacities? Restart Project – a London-based social enterprise – encourages and empowers people to use their electronics longer in order to save money and reduce waste. Restart helps people learn to repair their own electronics in community events (parties) and in workplaces and speak publicly about repair and product resilience. Today, Restart is working with 54 people in 10 countries who are planning on replicating and adapting the Restart model. 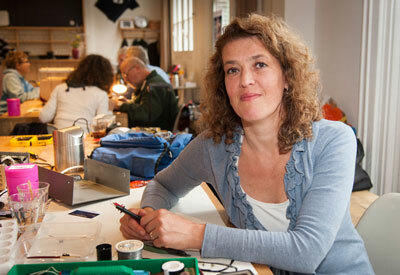 Conceived as a way to help people reduce waste, social entrepreneur Martine Postma organized the first Repair Café in October 2009 in Amsterdam. Its success prompted her to start the Repair Café Foundation in 2011. Since then, this non-profit organization has helped local groups start their own Repair Cafés. Today, there are more than 1,400 such cafés in 33 countries, from the US to Japan. According to the foundation’s 2016 annual report, repairing prevented about 250,000kg of waste from heading to landfills. Antara Mukherji, co-founded Repair Café Bengaluru in November 2015 with Purna Sarkar. Since its inception, Repair Café Bengaluru has organized 19 workshops where adults pay a programme fee and learn how to repair household things ranging from an iron to an induction top. The organization says it has repaired more than 700 products and saved about 1,300kg of waste from ending up in landfills. But in India, across the country, there are repair shops that can fix anything and everything. In Delhi’s Nizamuddin Basti area, Javed Husain Khan repairs and sells old Swiss watches, from Favre-Leuba to Rolex; Nehru Place in Delhi thrives on the economics of repair; brothers Muhammad Moinuddin and Muhammad Mujeebuddin claim their 80-year-old shop in Chatta Bazaar Road in Hyderabad’s Old City is the ultimate repair destination for vintage radios, record players and cassette decks—the list goes on. Chor Bazars or Thieves market are hubs of innovation when it comes to repair, refurbish and remanufacturing. The skill of repairing, refurbishing and remanufacturing is dying slowly. Repairing is often considered as a vocation for the uneducated/underprivileged or a mere hobby. In large cities, you would not see repairwalas going from street to street, offering to fix broken items. We now have web-based repair services – but these companies need to quantify, record and communicate the environmental and social benefits, Enterprises in the developed countries know very well how to do so and hence get cited in the international news, conferences and the like! We need a research group in India to take on such a project. I spoke to my Professor friend about the importance of inner circle approach especially the repair, refurbish and remanufacturing. “There is too much emphasis or hype on recycling alone and most think that circular economy means recycling” I said. Professor continued while handling a spanner and fixing a bolt “But to me Dr Modak, our engineering curriculums must include a course on repair, refurbish and remanufacturing with a workshop. It will help the students to look for alternatives, think out of the box and innovate”. We should leverage on India’s Make in India, Zero defect and Skill India programs. I thought that Professor was absolutely “Right”. That was yet another benefit in the asking for “Right to Repair”! I feel with times, we have discarded our old culture where we use to try to get the things repaired before discarding them eventually. Modern devices are also not repair friendly. There is need for complete rethink on the issue.